Dental implants are tapered and/or cylindrical posts. They are usually made out of titanium and used as a tooth root replacement. Frequently dental implants are the best way to treat missing teeth when an experienced implant dentist is employed for the procedure. When a decayed or damaged tooth is removed, the crown (visible part of your tooth) and the root are both lost and will need to be replaced. Dental implants are placed inside of the jawbone to enable them to fuse to your natural bone in order to become a sturdy and strong foundation for your replacement teeth. Dental implants may be used for a denture that contains multiple teeth, as an implant-supported bridge or to replace an individual tooth. They are a very flexible option that can be used in many different situations. The closest thing that you can get to natural, healthy teeth is dental implants. They enable you to confidently play, talk, laugh, smile, eat, and enjoy all of those activities you do in your everyday life without needing to worry about your teeth since they look and act in a completely natural way and are fixed in place. Keep in mind that dental implants are very sophisticated devices. That is why it is so important to ask any dentist who you are considering to do your implants if he or she is an implant dentist that is credentialed by the AAID. These dentists have proven levels of experience, skills, and education. Look for a credentialed implant dentist in your local area to perform your procedure. Dental Implant – A tapered and/or cylindrical post, that is made out of titanium usually and works as a tooth root substitute. Abutment – A connector, built into or placed on top of a dental implant, that connects to either the replacement tooth/teeth or to the implant. Crown – A replacement tooth, that is custom made to match your existing natural teeth. Who Are Dental Implants Best Suited For? 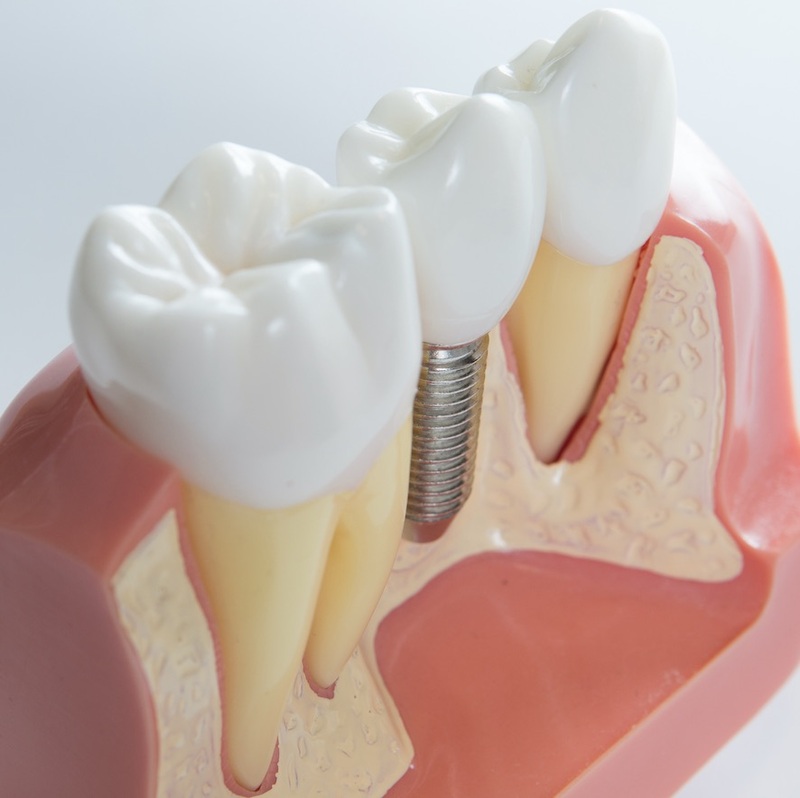 Dental implants can be used by patients of all ages. Implants might be the right choice for anybody missing all their teeth, multiple teeth or one tooth due to decay, disease, defects, or injury. They can potentially be an option for teenagers after puberty once the jaw has stopped growing, which for boys is around 18 years old and girls around 16 years old. An implant dentist will be able to determine whether or not dental implants are a good fit for you following a consultation where your medical and dental history are considered along with your specific needs. The dentist will discuss all potential options and help you make your final decision. We will be describing this below, but also don’t hesitate to get in touch with a local AAID-credentialed dental implant dentist. They are always happy to answer any questions you might have. They have excellent examples of real-life dental implants, models, and pictures that will be very helpful for you. The reason why you will love dental implants so much is that missing teeth that are restored by using dental implants function, feel and look exactly like natural teeth. They are brushed and flossed just like natural teeth, and you have regular dentist visits for cleanings and check-ups just like you would with natural teeth. Your dental implant, which is normally a tapered and/or cylindrical post that is made out of titanium, is placed surgically inside of your jawbone. While you are healing, the implant osseointegrates or fuses with, your jawbone. The two of them grow together and form a long-lasting and strong foundation for the replacement tooth. The healing process may take weeks or even months while you are carrying on with your daily life in between your dentist appointments. After the implant has bonded to your jawbone, an abutment – which is a small collector – gets put on top of your dental implant. It connects the implant to your replacement teeth or tooth. Dentures that contain multiple teeth, an implant-supported bridge, or individual tooth is attached to the abutment next. The dental implant acts and looks like your natural teeth, so that is why it is so important to find an experienced implant dentist who can perform the procedure for you. Are Dental Implants The Best Option For Replacing Your Missing Teeth? 1) Would you like to have the most natural-looking smile? Dental implants function, fit, and feel just like natural teeth. Other options might interfere with your regular daily speaking, smiling, and eating. 2) Would you like to have a smile that is hassle-free? Dental implants enable you to brush your teeth the way you normally do, eat practically anything you want, and bite naturally. Other options might have to be removed to clean them, restrict your food options, and make you feel uncomfortable when you are eating. 3) Would you like to have a smile that doesn’t embarrass you? Since dental implants get fixed into place, they don’t shift, click or move, which means you can be confident in your smile. With other options, they might slip while you are laughing, talking, or eating, which isn’t something to laugh about. The following is everything that you need to know about dental implants when it comes to missing teeth. Dental implants (tooth implants) are the best option for replacing teeth since they act and feel like natural, healthy teeth. A dental implant (tooth implant) acts and feels the way your original tooth did (maybe even better) when a credentialed implant dentist implants it. Dental implants (tooth implants) are designed to last. Some of the other options, including certain kinds of dentures and dental bridges have a tendency to need to be replaced. The costs can make the total overall cost higher. Dental implants, on the other hand, can last a lifetime when installed by a dental implant specialist. You won’t be embarrassed by dental implants (tooth implants). Tooth-supported replacement teeth or removable dentures may click or slip while you are laughing, eating, or talking. Dental implants, on the other hand, stay in place, which gives you peace of mind. It is, of course, very important to have an experienced dental implant expert place your dental implants. © 2018 www.MidValleyChamber.com. All rights reserved.